Actress and lifestyle guru Gwyneth Paltrow just spent $4.9 million on an oceanfront property in Montecito, California, near Santa Barbara. Sitting at 2.4 acres total, the property includes two existing homes that are slated to be demolished. The listing noted it was being sold as vacant land and that approval was already granted for construction of two new houses. Nonetheless, the listing included pictures of one of the teardowns, which was a four-bedroom, four-bath home that was built in the 1980s. 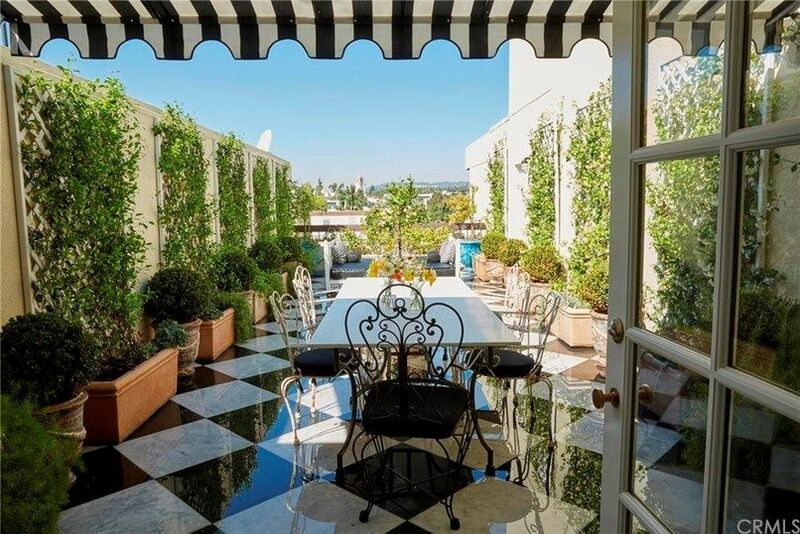 Reality television star Lauren Conrad listed her duplex penthouse in Beverly Hills, California for $3.2 million. Conrad initially purchased the two-bedroom, two-and-a-half-bath condo in 2012 for $1.35 million. She renovated from top to bottom and had new plumbing, electrical, and HVAC systems installed. The kitchen is outfitted with a subway tile backsplash, open shelving, a farmhouse sink, a La Cornue oven, a Wolf drawer microwave, and a Sub-Zero refrigerator. An exposed brick wall carries throughout the living room, where the spiral staircase leads up to a lush, checkerboard marble-tiled outdoor roof deck fit for Alice in Wonderland. On the same level is the master suite, which includes a dressing room, clawfoot tub, glass shower, and balcony. The condo also has a dining room, breakfast nook and wet bar. Conrad is active in the real estate market, and her holdings include a Colonial Cape in Los Angeles’ Brentwood neighborhood she bought for $3.65 million, as well as a mock-Mediterranean house in Pacific Palisades that she purchased for $4.4 million earlier this year. With her husband, William Tell, she also owns two homes in her hometown of Laguna Beach, California, worth $8.5 million and $2 million. According to The Wall Street Journal, former actress and celebrated fashion designer Ashley Olsen recently purchased a $7.3 million townhouse in New York’s Greenwich Village neighborhood. The 3,000 square foot home is in a building built in 1898 and used to be an art gallery that was recently converted into six condo units. Her particular unit has two bedrooms and two-and-a-half baths, but is highlighted by 11-foot ceilings, a private elevator, and north and south exposures. The finishes are befitting someone with good taste: Calacatta marble, a reclaimed marble vanity from the Museum of Modern Art, as well as Miele, Wolf and Sub-Zero kitchen appliances. Actor Don Cheadle and Bridgid Coulter put their Venice, California home up for sale at $2.45 million. Before its renovations, it was a cozy 800 square foot bungalow. Coulter, who is the owner of Santa Monica-based design firm Bridgid Coulter Design, completely transformed the property into a two-story dream home with vaulted ceilings and a rooftop deck. Raw poured concrete and rust-colored panels give the home an industrial feel, though it’s ensconced within a walled garden. Inside, cool hues, lightly-stained French oak floors, and a metal-railed staircase complement the pendant lights above the dining area. The house has three bedrooms, including a master suite with a walk-in closet. The second staircase delivers a rooftop deck and outdoor living room. The couple bought the house two years ago for $894,000.